There are probably eight million recipes for slaw and this is just one of them. Ok, this is really dating myself (again). But, back in the 50’s there was a TV show called the Naked City and the tag line for the show was “There are eight million stories in the naked city, and this is has been one of them”. Happy Halloween everyone. I should be posting a pumpkin recipe I guess but this recipe with roasted, salted pumpkin seeds is as close as I’m getting to a pumpkin today. Ya know, there are probably a million recipe for slaw/coleslaw out there in the universe just circulating through the Internet and I can’t believe I have never posted a slaw recipe because I probably have at least a gazillion in my recipe files. 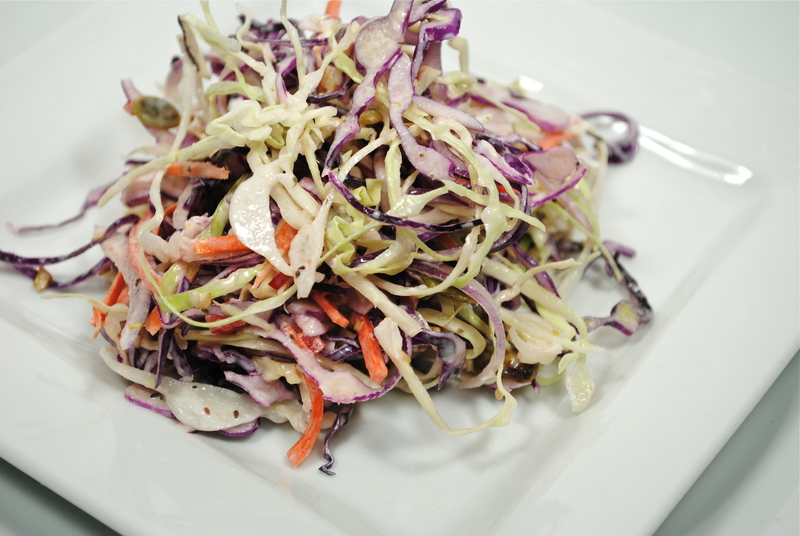 This recipe for Rainbow Coleslaw with Roasted Pumpkin Seeds is a beautiful slaw with colors of the rainbow. 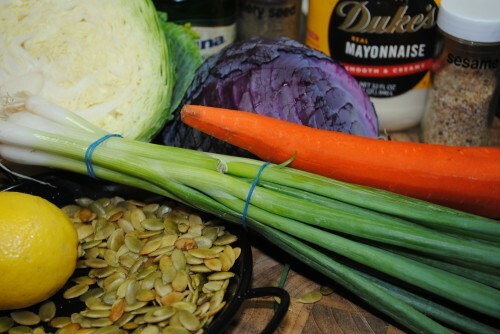 The purple and green cabbage along with the orange carrots and green onions make this a very attractive addition to any plate of food. Growing up my mother would make several types of slaw. One I remember was called freezer slaw (or really a refrigerator slaw). That particular recipe had shredded cabbage, onion, green onions and green peppers and the dressing was a boiled dressing of sugar and vinegar and a few spices. The dressing would get poured over the slaw and you could keep it refrigerated for at least a month and it would stay crunchy and fresh. There is also a hot slaw I make that is cooked shredded cabbage with tomatoes, onions and green peppers and lots of black pepper. Now, don’t ask me why it is called “slaw” since it is cooked, but that is the name of the recipe. My mother-in-law always had a special type of slaw she made when she cooked fish for us — a mustard slaw. Her recipe had a little mustard, mayo and a little sugar to sweeten the slaw a tiny bit. For BBQ dinners I like a slaw that doesn’t have mayonnaise in it. And, who doesn’t love KFC coleslaw. I have learned the secret to the thin dressing is adding some milk to the mayonnaise. One of my favorite slaw recipes is one I’m sure everyone has made that has Ramen noodles and sunflower seeds. A friend of mine always makes that when I ask her to bring slaw and it is delicious with the toasted nuts and noodles added in right before serving. Roasted and salted pumpkin seeds are a wonderful addition to this slaw. Shred everything either using a mandoline or very sharp knife. How ever you cut it, do it very thinly. 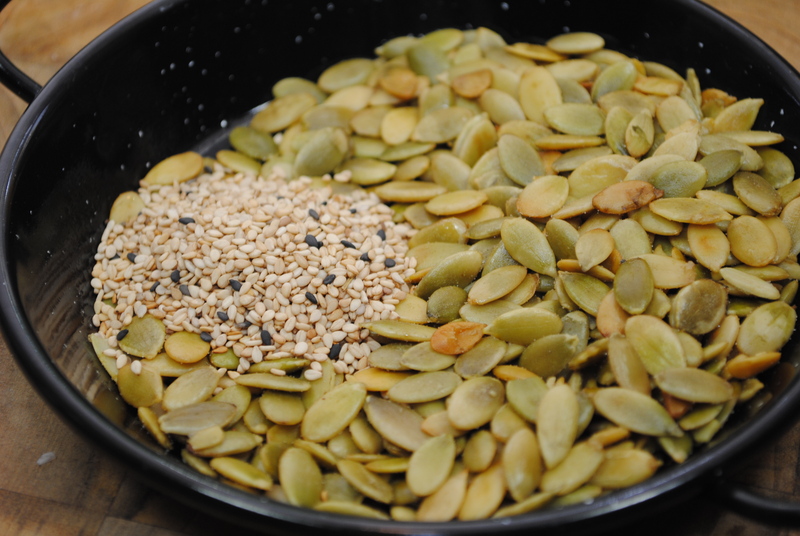 I toasted my sesame seeds over my gas stove but I bought the pumpkin seeds already roasted and salted. 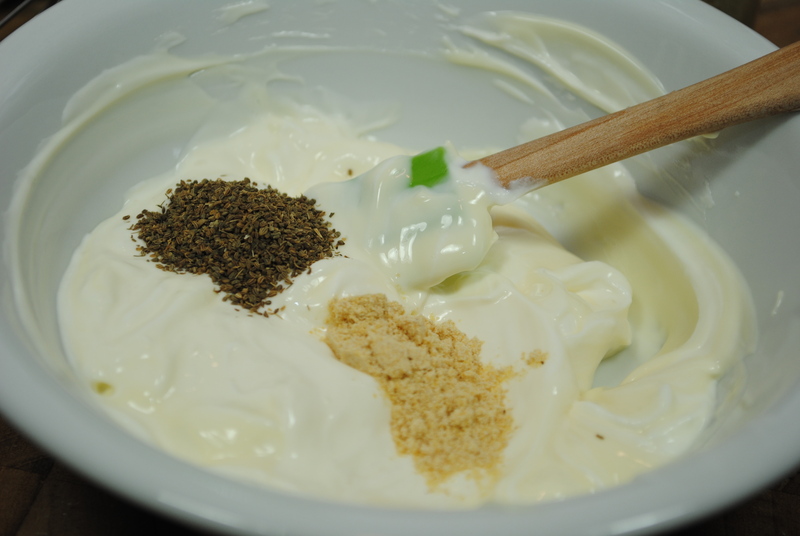 Whisk all the dressing ingredients together and thin with a little more milk if needed. Combine all the dressing ingredients and whisk to blend. Refrigerate until ready to use. 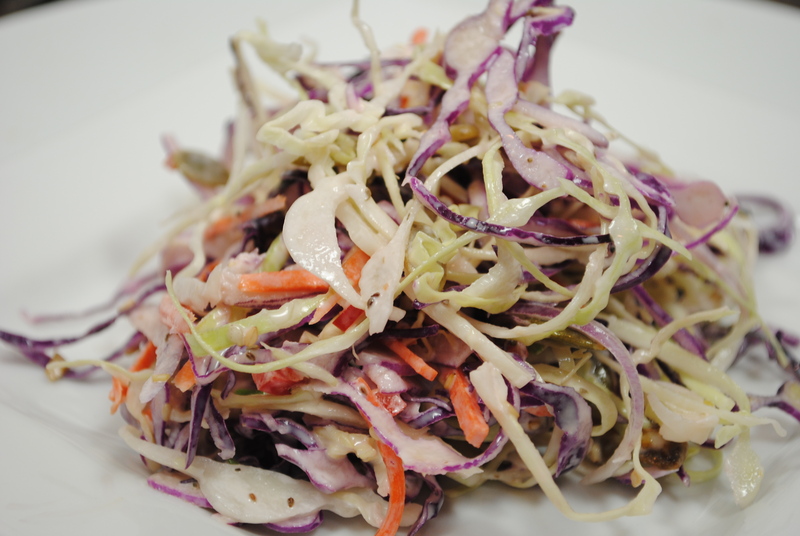 For the slaw, use a mandoline if you have one and cut the red and green cabbage as thin as you can cut it. Peel and julienne the carrots. (I use a julienne tool). Slice the red and green onions. 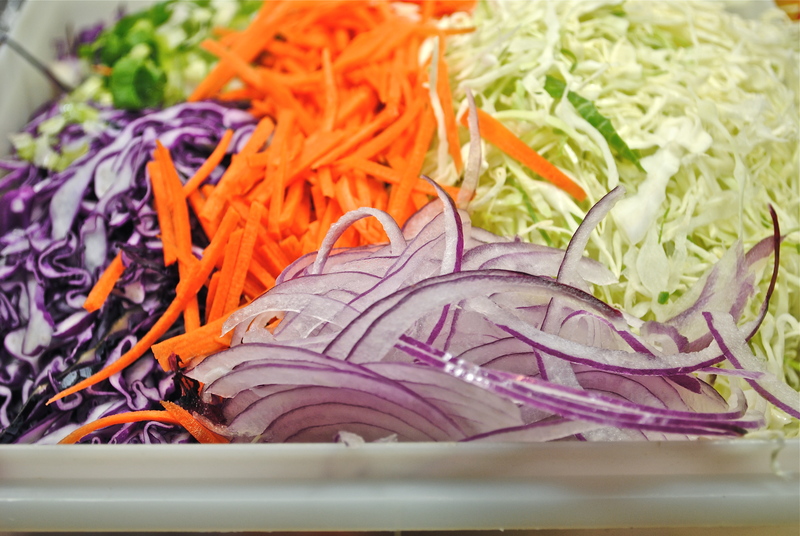 Toss the cabbages, carrots and onions together. Pour on just enough dressing to lightly coat the slaw and toss to combine well. Add the pumpkin and sesame seeds and top with a squeeze of lemon juice.